Robotic arm uses learning algorithms to catch at Switzerland's Ecole Polytechnique Federale de Lausanne. The robot arm catches a tennis racket thrown from across the room. It wouldn’t normally make sense to have a robot play baseball. There are so many part of the game that the robot wouldn’t understand—like the infield fly rule. But robots can definitely play table tennis. And using the same type of robotic arm and a special robotic hand, Swiss researchers have created a robot that can catch just about anything, even a fastball from a pitcher. 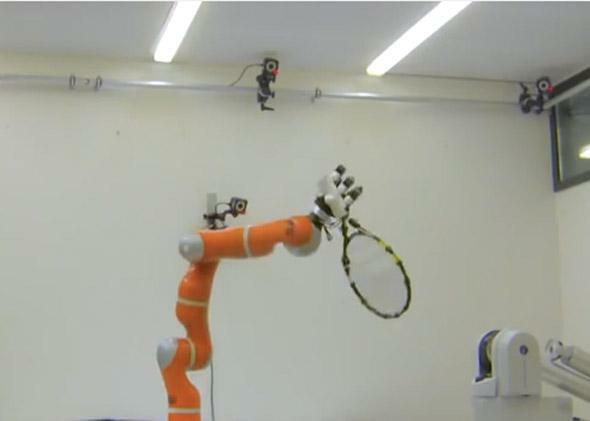 To make the catching machine, researchers at the Learning Algorithms and Systems Laboratory within Switzerland’s Ecole Polytechnique Federale de Lausanne used a lightweight robot arm made by the German company KUKA, combined with an Allegro Hand from the Korean company SimLab. Since KUKA’s lightweight robot arm is trained by a human who positions and repositions it multiple times, the researchers could guide the robot through the catching motion, allowing test objects to bounce off its hand, until it understood its goal and how it needed to place itself. Once trained, the robot could use its camera “eyes” to track objects flying through the are toward it, and position its arm and hand to catch them. The engineers published their findings last week in IEEE Transactions on Robotics, and hope to continue with related research. The goal is to make robots less oblivious and more able to react rapidly to changes in their environments. They may not start playing in the MLB any time soon, but it might be fun to watch an all-robot softball league.